Professional Mermaid Entertainment - Bring a bit of fantasy to reality at your next event! Under Construction - Please excuse the mess! Who are the New England Mermaids? 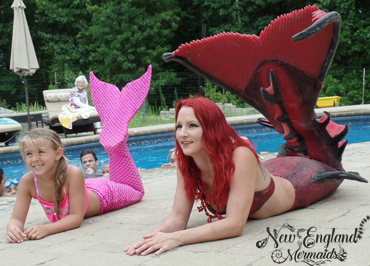 New England Mermaids provides real live Mermaid and Mermen entertainment for events in Massachusetts, Rhode Island, Connecticut, New Hampshire, Maine, Vermont, Cape Cod, Martha's Vineyard, Nantucket, and anywhere you wish to bring a bit of fantasy to reality. Mermaid entertainment is great for all ages. Our tails are custom molded silicone and they look and feel real! We are available to swim at pool parties, beach parties, lake events, aquariums, ponds, fountains, and anywhere with a body of water! No water? No problem! Our Mermaids are available to do land appearances, whether sitting in a chair or propped on a decorative table while mingling and taking photos with guests, or our specialty Mermaid Bartender can pour champagne, liquor, or pre-mixed drinks for your guests! The possibilities are endless! You'll never forget the fun! Like right out of a fairytale! New England Mermaids are very versatile in their capabilities. The possibilities are only limited by your imagination! We provide professionally trained Mermaids for all events. Our Head Mermaid has been delighting clients for 9 FINtastic years! With our experience and professionalism, you can be sure that your event will be a SPLASH with our Mermaids! Not only do our Mermaid's tails look real, but they FEEL real too! Our Mermaids have high quality, realistic looking and feeling custom made silicone Mermaid tails that are incredible in and out of the water. Children and adults alike enjoy feeling and seeing just how realistic these tails are! We offer a truly unique service to our company, Mermaid Bartending. One of our gorgeous Mermaids, propped up on a sea-themed decorated table, will pour Champagne, shots, or pre-mixed drinks for your guests! Our Mermaids are available for both wet AND dry events. Whether you would like a Mermaid swimming in your pool, or a Mermaid perched on a rock taking photos with guests, we have the perfect package for you! Our Mermaids sure do make a splash at events! Guests go wild and guests talk about our Mermaids for quite some time after each event! After all, it isn't every day you get to swim with a REAL Mermaid! 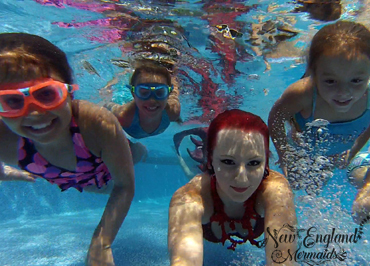 Our underwater video package includes an edited video featuring our Mermaid and your guests! Our Mermaid will instruct guests on how to perform for the camera underwater, execute maneuvers and Mermaid Kisses, and swim with our Mermaid for an incredible video experience! Make a SPLASH at your next event! We are available to appear at any and all kinds of events. Whether in the water or on land, our Mermaids are ready to bring fantasy to life! Make Your Party a Splash!